Iranian journalist serving as editor-in-chief of 'Radio Farda' arrives at defense minister's office, where he interviews Minister Liberman. 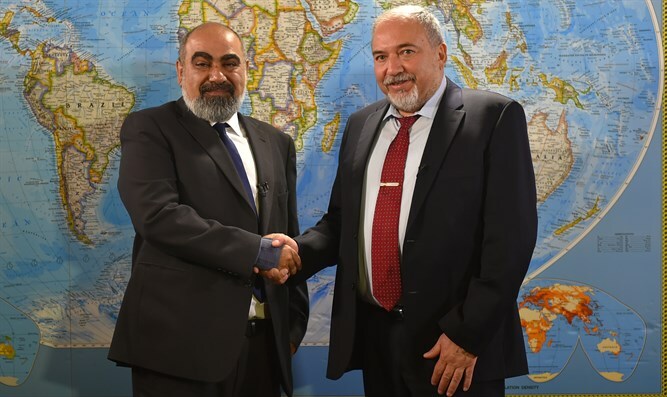 For the first time, a senior Iranian journalist came to Israel for an interview with Defense Minister Avigdor Liberman. The interview took place this week at the defense minister's office at the “Kirya” base in Tel Aviv. The interviewer was Mehrad Mirdamadi, the editor-in-chief of “Radio Farda” (“Tomorrow” in Farsi), which broadcasts from the city of Prague to tens of millions of Iranians. This is the first time an Iranian journalist has visited the defense minister's office. In an interview held partly in Farsi and partly in English which was published this morning, Thursday, in Farsi on the Radio Farda website, the defense minister asked to convey a message to Iranian citizens. "We hope that our message is very clear, we will do everything to prevent any Iranian attempt to establish military bases in Syria or to bring in other Shiite militias that threaten Israel," said Defense Minister Liberman. "Iran is a sovereign country and it has the right to maintain diplomatic and economic relations with Syria, but we will never agree to an Iranian military presence on Syrian soil and we will not accept Iran's efforts to harm Israel and destabilize the Middle East," Liberman said. Defense Minister Liberman said in the interview to the Iranian people: "Iran invests in terror instead of working for the younger generation. Instead of developing the economy and science, the Iranian regime invests only in military exercises and terrorism. It is a fanatical regime which has wasted, up until now, more than 13 billion dollars, and spends more than 2 billion dollars each year on terror financing throughout the Middle East. This is against the interest of the Iranian people. Why is a country with among the largest oil reserves in the world investing so much in a nuclear program and ballistic missile development? "